CIVITAS Urban Design and Planning Inc.
At a time when universities are summoned to assume their responsibilities in the shaping of major urban areas, in an era of ferocious educational competitions in which benchmarking and the Academic Ranking of World Universities (ARWU) released by Shanghai Jiao Tong University rule the educational market, some universities have decided to take the potential power of competitions to seek excellence in a very serious manner. This was the case when the University of Manitoba launched their competition for a new campus in December 2012. The “Visionary (re)Generation” competition was an open, international, anonymous two phases competition. In the first stage, 45 teams participated from all over the world, including Canada, Spain, Italy, The Netherlands, and Germany. Of these 45 projects, only 6 were selected, although the original plan was to select 7 finalists. The stakes were high as were the expectations of the academic community and ambitions of the university’s president. With a ratio of 15%, Manitoba is by far the Canadian province in which First Nations have become an integral part of the community. It was no surprise that the “spirit of place” and the responsibility towards the people of the First Nations was at once a central and extremely sensitive issue during the entire process. Furthermore, the extreme climate conditions required rigorous consideration to render the campus walkable. And finally, the complexity of the urban scale required teams to reflect on the connection of the somewhat isolated campus to the city. In order to tackle such difficult and complex expectations and issues, the University of Manitoba requested the services of an internationally renowned German firm that specializes in the organization of competitions called, [phaseeins] (http://phase1.de). In this entire redesigned public interface of the Canadian Competitions Catalogue, and thanks to the organisers of this competition, we can now display substantial data about all 45 proposals. As a way to suggest a possible categorization of this variety of ideas coming from 17 countries we propose to follow a spread summarized in the jury report. Indeed, the proposals ranged from the more conventional master plans that favoured an orthogonal grid plan to the more innovative that proposed less conventional strategies with grids that functioned autonomously as a city within a city while linking to the main existing circulation system. 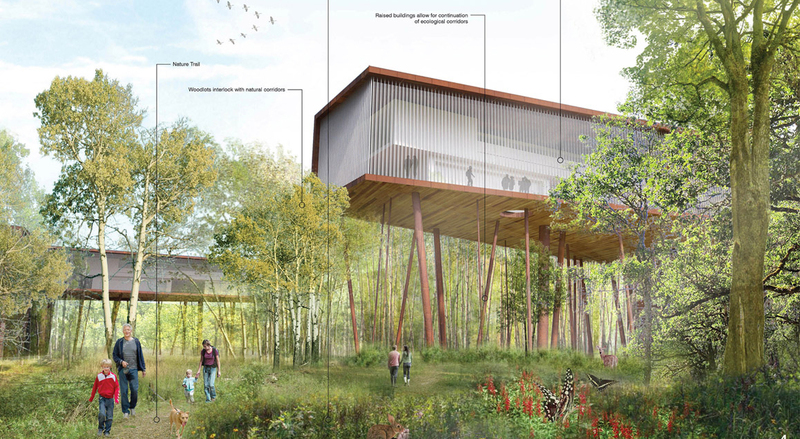 In what the jury called the more traditional category, the team Perkins and Will + 1X1 Architecture + PFS proposed a project that was highly praised by the jury yet provoked controversial discussions. The jury report praised this project because of “its feasible reflection on major parts of the brief, creating a well-balanced urban pattern with traditional blocks and defining a center with the potential for establishing a new heart or neighbourhood at the edge of the core campus.” Yet the most discussed issue by the jury pertained to the project’s vision, “which relies on a traditional adaptation of an urban type form that might appear foreign to the existing physical and cultural context.” (Extracted from the jury report). The winning scheme by Janet Rosenberg and Studio Inc. + Cibinel Architects Ltd. + Landmark Planning and Design Inc. proposed a project that was considered by the jury as a promising long-term strategy conducive to the re-generation of the site. The clarity of this concept, which proposed the densification of the existing campus plus a series of new distinct neighbourhoods, also triggered insightful discussion within the jury regarding the, “relation between fundamental principles of urban design and the value of visionary strategies for the creation of discrete places for living and working”. This project was considered by the jury as the most appropriate because it sought to connect to the river both spatially and visually and proposed an atypical neighbourhood plan sensitive to place and space. In closing, one can wonder why – with an increasing number of competitions organized every year in Canada – the University of Manitoba decided to hire the services of the European group [phaseeins] to help them in organizing an international competition. As we were invited as scientific observers, we can offer a few clues to such a question. First, the issue of transparency was never compromised, on the contrary, and the fact that we were warmly welcomed to observe the two phases of the jury deliberation process is in itself uncharacteristic to most competition processes in Canada. As regular contributors and analysts of the CCC, we could also see that this organisation was not a ‘copy and paste’ process from another competition, but rather a serious and meticulously planned process of both quantitative and qualitative judgement. The European team of experts pre-analyzed all projects, provided a diversity of very informative statistics to the jurors, and provided all these in a very organized and comparable manner. Last but not least, the organisers not only agreed but insisted to display all the proposals as soon as possible of the CCC. At a time when universities have the possibility to assume their role in the re-shaping of public space, it certainly takes a high degree of organisation to deliver the 3 pillars of competitions: quality, fairness and transparency. Carmela Cucuzzella and Camille Crossman. A thriving, connected community where a conversation at a small café gives life to the next big idea. A walkable, truly urban neighbourhood where a culture of learning and discovery powers the innovation that turns a campus into a destination. Visionary (re)Generation is an open call to re-imagine the University of Manitoba's Fort Garry campus. It's a global invitation to bridge the University's highest strengths with the best in forward-thinking, sustainable urban design from around the world. The Visionary (re)Generation Open International Design Competition is a challenge to the world's most innovative landscape architects, architects and planners to rethink the campus and create a bold new blueprint that will secure a strong future for the U of M.
Visionary (re)Generation will transform the University of Manitoba's Fort Garry campus into a sustainable, people-centred hub where campus meets city; a 24/7 urban village where daily life is energized and enriched by vibrant local businesses and great public spaces - always just steps away. For those who call it home, the re-imagined Fort Garry campus will be a welcoming, inclusive community where residents of all ages enjoy the best of city life while being just moments away from the classroom. For those who visit, the campus will be a magnet for all who find inspiration in bustling streets animated with colourful boutiques, human-scaled architecture, vibrant culture and local art. Visionary (re)Generation offers a once-in-a-generation opportunity to transform a university, but also a unique opportunity to set the standard for the way great campuses are built. Just as this open international design competition will unite the city with the campus, it will also unite some of the world's most accomplished urban thinkers with the local voices most closely connected to the community's existing strengths, needs and visions for the future. The project promotes the most appropriate, robust, and promising long-term strategy for the re-generation of the site. It successfully proposes to maintain and strengthen the qualities of the existing Core Campus understood as the heart of any future development. The project manages to re-frame the stadium as an object embedded in a park that follows and reinforces existing site conditions. The scheme suggests a pattern that combines both landscape and urban elements, which establish strong visual and spatial connections to the river a form of landscape-urbanism that neither follows the structure of typical downtown develop- ments nor of mono-functional suburban neighbour- hoods. Promoted instead is a place of living in the prairie. The Southwood district is based on a rhythm of dense and open zones, defining open edges on Pembina Highway and along the Red River a striation of fields traversing a central green. The building sites are carefully conceived as filters in the East-West direction. Similarly, connections are established between the small-scale development to the North and the Core Campus to the South. High value is given to a variety of well-designed places and open spaces, with great attention given to proposed uses and the articulation of boundaries. The park successfully creates an open field that provides a counterpart to the large-scale object of the stadium. The smaller spaces between the buildings in the Southwood district serve a series of functions, including nature preservation, educational uses, and recreational areas. Smart Park receives a new identity through a green axis and an open water canal. The Southwood plan offers what the Core Campus does not have a place to live and interact with nature. Consequently the scheme proposes a densification of the existing Core Campus and a dense urban frame- work for Smart Park. The insertions within the Core Campus strengthen the role of the university as the central urban nucleus of the site, articulating its edges and defining clear transitions to adjacent precincts. The concept is praised by the jury for its feasible reflection on major parts of the brief, creating a well-balanced urban pattern with traditional blocks and defining a center with the potential for establish- ing a new heart or neighbourhood at the edge of the Core Campus. All in all, the spatial and functional organization of the plan successfully responds to the needs of everyday life and establishes well-considered connections to the university. The plan includes a large-scale green zone in the North that is respectful of existing trees and creates a buffer to neighbouring precincts. Conceived as a green connection, the park along the river is spatially framed by a series of new buildings. Here, a range of activities is offered, including a series of elements that incorporate indigenous culture. The transportation network is viable, offering access routes for vehicles as well as appropriate and economic parking structures. Infrastructure planning is well executed. The clear urban pattern of the proposal comprised of dense blocks and large open areas, including well-designed sequences of public spaces success- fully creates a balanced layout with a feasible phasing strategy and an appropriate mix of functions and spatial qualities. For Southwood, the scheme provides both a framework for marketable units and for habitable neighbourhoods with places to live. The proposed street grid is appropriate and supports the integration of various transportation systems. Climatic issues are well integrated and the application of renewable energy is well considered. The large park to the North and the zone along the river are important elements of the project. The densification strategy for the Core Campus supports connections to South- wood and provides feasible solutions for the further development of the university. Similarly, the proposal for Smart Park combining buildings and open spaces offers great potential for the development of a new district with urban characteristics. The conceptual rigor, visionary approach, and architectural development of the project convinced the jury of the scheme's inherent qualities. The authors make a statement in terms of proposing a clear and strong vision, one defined by spatial continuities and visual markers. A series of clusters are placed within a continuous landscape, with buildings conceived as part of the modulated terrain. Subtle spatial interven- tions connect the Southwood district with the Core Campus. Though forming different neighbourhoods, the scheme is driven by a unifying language of architectural elements: carefully designed mounds, towers, courtyards, and walkways. The jury appreciated the scheme's great sensibility for the landscape and specific characteristics of the plan. The architectural design generates high uniqueness and a true potential to create an identity for the new neighbourhoods with their landmark towers to the outside and the hamlets to the inside. This goes along with a promising sustainability concept, incorporating local food produc- tion and technical solutions for saving resources.